"Alright, don't get on the blue switch yet; go into that little corner instead." "Ok I'm there, now let's see what the red switch does..."
Upon pressing the red switch, the laser cannon both of us forgot about fires, and the blue cube explodes. We laugh for a bit -- and as the stage resets, we make sure to keep an eye on the laser, only for one of us to overexcitedly careen off the edge of the stage. The laughter starts anew. 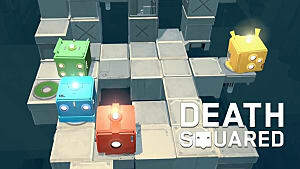 This is what it looks (and sounds) like to play Death Squared, a clever little game with a simple goal: get all of the players' cuboid robots to the correctly colored circle-pads on the floor. 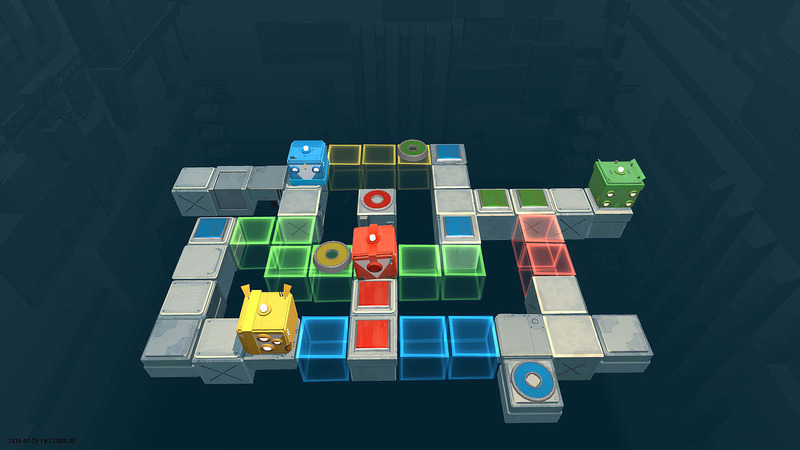 Where the fun comes in is with the variety of different puzzles and traps involved in getting to those circle-pads. 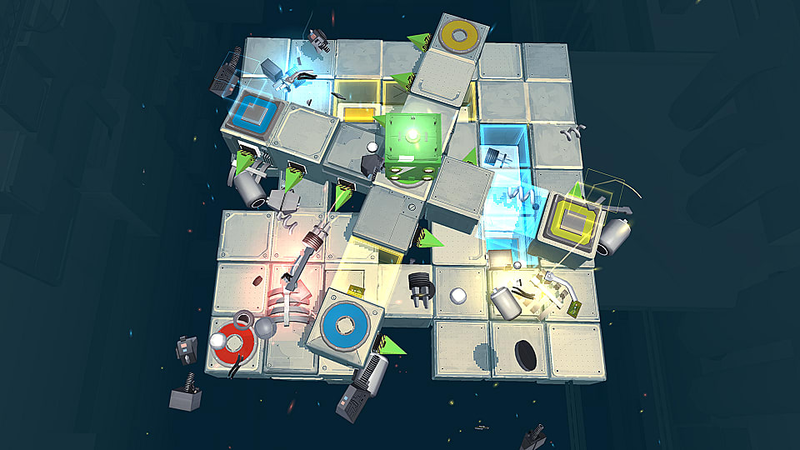 The robots have only one thing they can do to solve these puzzles: move. And the puzzles you must solve vary via a series of clever mechanics involving this basic movement. Some objects, like lasers or blocks, move as your cube does, meaning that moving too quickly could end up frying your partner. The puzzles do a good job of staying varied by slowly introducing you and your cuboid pals to new concepts, teaching you how they all work and slowly increasing the difficulty in applying those ideas. As you get further into Death Squared, it starts pairing these different concepts with each other and bringing old ones back out of nowhere to catch you off guard. Remember those spike traps from level 11? Here they are again (suddenly) in level 32, and now, there are also ghost blocks that will shove you into them if you feel like speeding through without your partner. Death Squared keeps you on your toes with each puzzle, but here that means being cognizant of what elements you need to deal with. It's not the type of game that requires twitch reactions and split-second inputs. The progression of ideas from level to level feels natural, and most every death is because you (or your knucklehead partner) didn't consider everything, not that the game screwed you. 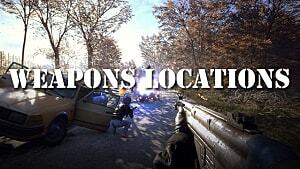 The game also does a fantastic job of keeping you playing for a good long while. Almost every stage can be done pretty quickly if you do it right, so "One More Level" syndrome in Death Squared is alive and well. This is a game where conversation and planning strategy with your partners is absolutely necessary if you want to proceed. If even one of the cubes dies, it's over for every player, meaning that if you want to get to the next stage, you need to cooperate and communicate. Each cube has different things they can control or interact with (and are colored appropriately), so planning every move everyone makes is essential in some levels if you don't want to explode. After all, if Green runs to that button before everyone is ready, Blue explodes and it's back to the beginning with all of you. The game does a great job of fostering this conversational attitude over time, too; early levels can be blasted through quickly, but as you progress, you'll need to talk with your partners more and more to make sure everything falls in line to avoid a fatal slip-up. Every threat looks the same every time, meaning that after the first encounter, there are no surprises, and they're all easily identifiable. And even if you don't plan well, the penalties are light and quick enough that failing is far more humorous than it is frustrating -- and sometimes it's extra satisfying to shove your partner off the stage because they messed up that one time when you were so close. As far as plot goes, there's not much to speak of. The player characters are AI bots being run through a series of test chambers, monitored by two offscreen voices who work for your usual world-controlling corporation. One of these is David, a human male worker who acts as the comic relief, and the other is I.R.I.S. -- a female AI who is the straight man to David's antics. The influence of Valve's megaton Portal franchise is clear from the get-go, but David and I.R.I.S. are unique enough that, at worst, they feel like homages rather than ripoffs. 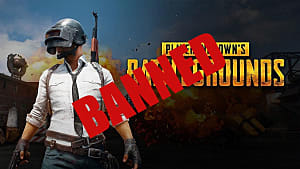 Their effect on the game is minimal, and you never actually see them, but they banter in between levels and make comments if players do exceptionally well or exceptionally poor. These two disembodied voices provide a bit of backstory with their dialogue, but there's not much -- and to be fair, it's not really needed. Visually, the game is quite simple -- but not in an ugly or otherwise unpleasant way. The levels are all made up of cookie cutter blocks and objects, and the characters are simple (though expressive) cubes that you can decorate with some decals if you like. Considering what the game's aiming to be though, these visuals are a good fit. Death Squared is a game solely focused on having a good time with some friends, and it does that quite well. Like any game, Death Squared isn't without its flaws. The puzzles are fun and fast, but in some stages, the threats aren't 100% apparent. In a few of the stages of our playthrough, I got fried several times by a laser cannon I didn't even see activate because it was offscreen. Movement in Death Squared is also very sensitive -- meaning that if you're slightly off-center on a block, you might get caught around a corner and slide off the stage. But that's something that you get used to as you play the game, and is in no way a dealbreaker. On the Switch, with some Joycons' tendency to not always send the right inputs, this problem can get exacerbated a bit. However, even with a buggy Joycon, the game still controls just as well as any other version and, barring the occasional slide that's a little bit too long, it doesn't negatively affect gameplay too much. Taking the game on the go is obviously the big draw to the Switch version, but with a game that requires you to be conscious of so many different puzzle pieces in one environment, this might be one of the few instances where the smaller screen hinders the experience. Death Squared's biggest problem, though, is the limited amount of content. 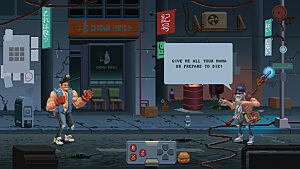 The game only has 80 two-player levels, 40 four-player levels, and a gallery for each unlocked by beating them. Considering how fast these puzzles can go, that's not much. 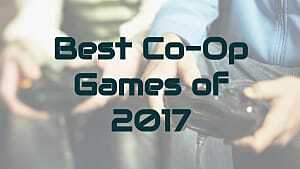 If you've got the people for it, you can knock the game out in a few hours -- and with no real replay value, that's all you'll get out of it. Some kind of versus mode or time trials would've added some replay value, but no such option exists as of now. 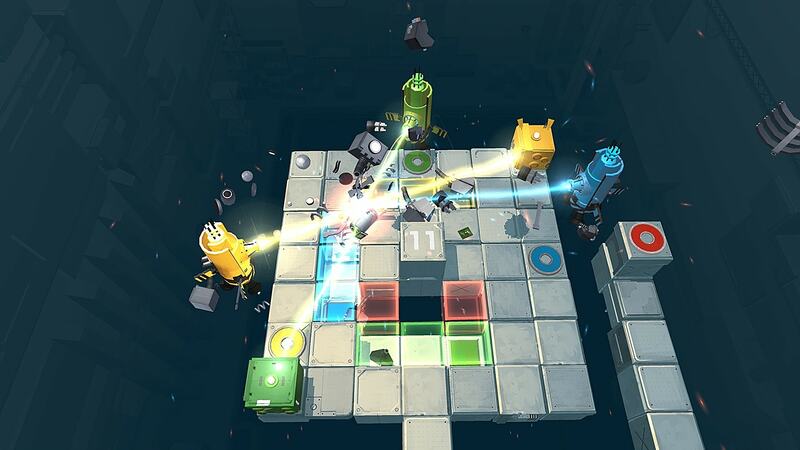 All in all, Death Squared is a blast to play through with friends, but that blast doesn't last long. The puzzles are quick, creative, and fun -- but the limited content you get for its price point of $20 means that the game will be over all too quickly. 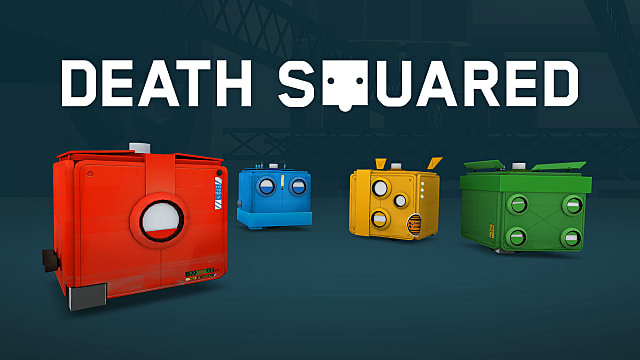 If you're looking for a day's worth of puzzling fun though, Death Squared is a great choice. If you don't own a Nintendo Switch, this game is also available for PC and console. 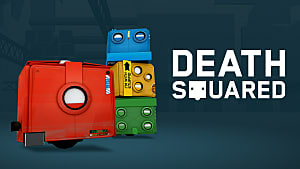 Check out our review for Death Squared on PC for more information! Note: SMG Studio provided a copy of Death Squared for the purpose of this review. 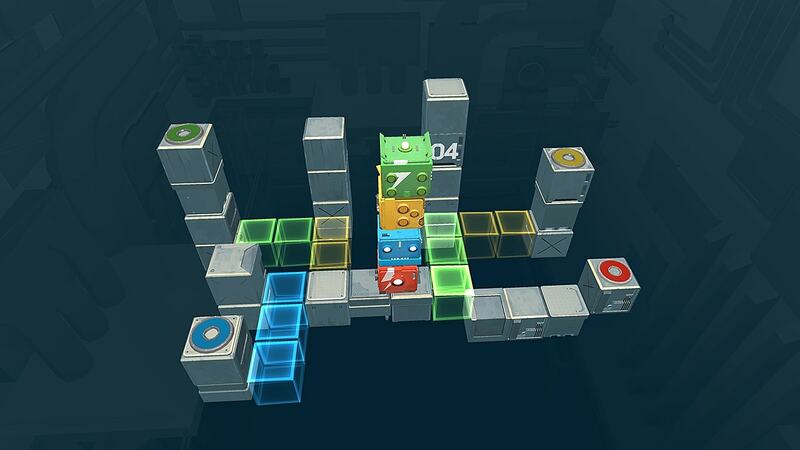 Death Squared doesn't reinvent the cube, but it's a cute puzzler and great fun with friends. 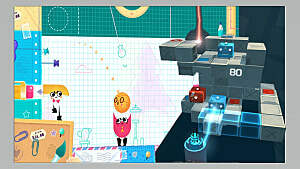 Snipperclips vs Death Squared: Is One Better Than the Other?